. Thanks to our friends at MLBAM, as of today, you can cast live games straight to the TV with a tap of the cast button. MLB.TV is the latest live streaming service to come to Chromecast, so now MLB.TV Premium subscribers can invite their friends over to watch live, out-of-market games. You can even choose between home or away broadcast feeds to steer clear of the opposing team's announcers. The MLB.com At Bat app can be found in the Play Store and Apple Store, with Chromecast support rolling out starting today. MLB.TV Premium subscription required. Peanuts and Cracker Jack sold separately. As always, explore the latest new apps on Chromecast.com/apps. The 2014 Major League Baseball season is off to a big start, and now you can make all those hits, homers, steals and K’s even bigger with Chromecast. Thanks to our friends at MLBAM, as of today, you can cast live games straight to the TV with a tap of the cast button. , we’re making it possible for you to do the same thing from your Android device. If you haven’t used Chrome Remote Desktop in the past, you can get started by enabling your Windows or Mac machine for remote access through the Chrome Web Store app. Next, simply launch the Android app on your phone or tablet, tap on the computer’s name and start using your remote machine as if you were sitting right in front of it. Download the Android app from the Play Store, and stay tuned for the iOS app later this year. Have you ever been out and about, and urgently needed to access a file that’s sitting on your home computer? Since 2011, Chrome Remote Desktop has let you remotely access your machine from another laptop or computer in a free, easy and secure way. 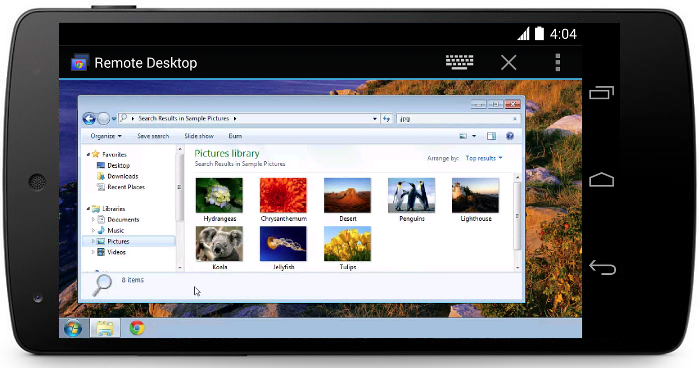 And now, with the release of the Chrome Remote Desktop app for Android, we’re making it possible for you to do the same thing from your Android device.